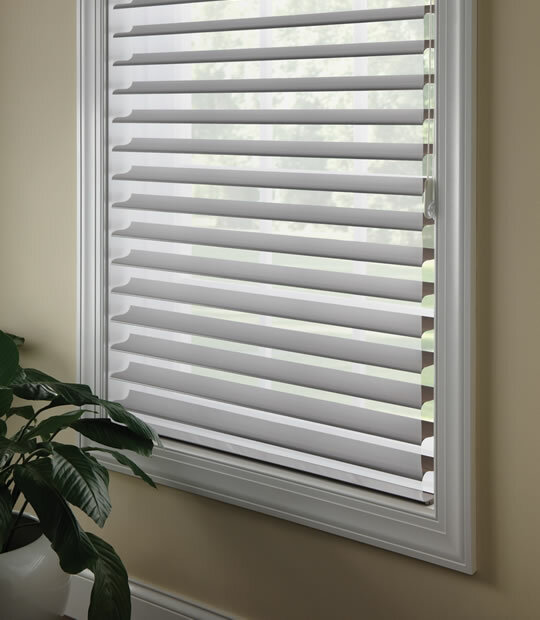 The Room Darkening sheer fabric vanes can be positioned fully open, fully closed or anywhere in between for the privacy control you want. And unlike any other window shading available, Sheer Shades can be raised with the vanes still open. Perfect for bedrooms, media rooms or anywhere additional light control is desired. View the world with sheer wonder. Soft, light diffusing vane and double sheer fabrics blend to create a unique visual experience. Horizontal fabric vanes float between two layers of soft, knitted sheers. Available in 2-inch and 3-inch vane widths. Vanes glide from open to closed to out of sight inside elegant hardware. The warranty does not include any conditions or damages resulting from accidents, alterations, misuse, abuse, misapplication, improper handling, installation, repairs, operation or cleaning, exposure to the elements or excessive heat sources. This warranty does not cover variation in color, grain, or texture in natural wood products nor excessive warping of wood slats in high humidity areas. Loss of pleating is not covered if the product is not being cycled (held in the raised position a portion of the time). Normal wear and tear is not covered. All moving parts, such as cords, will eventually wear out and fabric may fray. Comfortex considers these things as normal wear and tear and will carry a three year limited warranty. This limited warranty does not cover transportation costs to and from the retailer, costs of removal, re-measure, or reinstallation of product, or any incidental or consequential damages. This Warranty is exclusive and in lieu of all other obligations, liabilities or warranties. In no event shall Comfortex or its licensed fabricators or distributors be liable for incidental or consequential damages, or for any other damage, loss or expense, cost or fee associated with such damage. In some states, exclusions for incidental or consequential damages are not allowable.